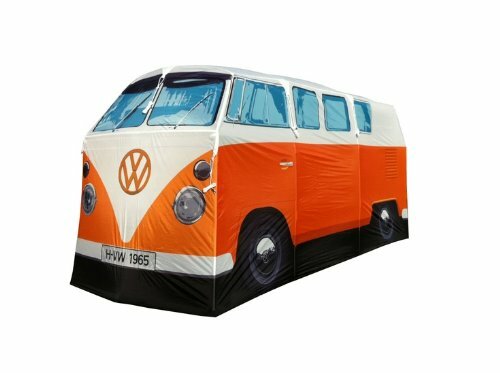 1965 VW Camper Van Tent – Welcome to Cool and Crazy Gadgets! With the capability to stand up even when inside this tent, get your speakers out and crack open some beverages as you use your VW Camper Van Tent as an awesome social soundroom. Get ready for your festival gear in style. The rain will never be able to dampen your spirits! Whether you’ve been out hiking all day or just made it through your first first rampant day of a festival you’ll have no problem spotting this unique masterpiece from many fields away. It’s also perfect for family holidays away, as children will truly feel like they’re living the VW Camper Dream! Accommodate guests and have a roomy, comfortable nights sleep with its awesome double compartment interior. With the VW Camper Tent you can experience the true luxury of camping. With this much room and comfort you’ll be able to surround yourself with a sea of blankets. With free standing poles and bungee cords with clipped connectors popping up this tent could not be any easier. This tent is sufficiently able to handle a water gauge of 3000mm on its roof and 1000mm at it’s sides. On come the rain! If things ever get a bit “in tents” in the bedroom then the VW Camper Tent offers great privacy from the outdoors. With plenty of room in each separate compartment, it’s like having your own room.